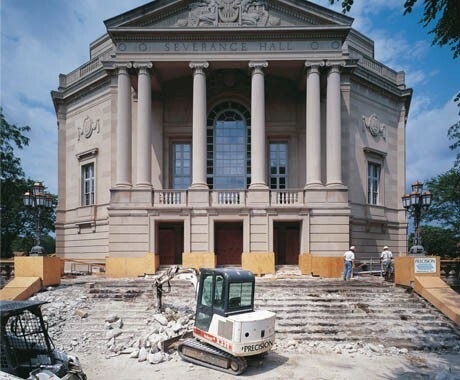 Building owners and construction contractors often turn to Precision Environmental Company when an interior demolition project requires innovative solutions to unique construction problems. We are best known for our ability to work safely and effectively under challenging conditions with tight time frames and high risk associated with intricate and often irreplaceable building components and design features. Many of our projects involve restoration of historically significant buildings, and preservation of architectural components is critical to project success. Precision’s team can devise a plan and execute it to ensure that these structures will remain intact and undamaged. Precision has provided highly specialized demolition services for many technical and industrial facilities, including NASA Glenn Research Center and various ArcelorMittal Steel facilities, where a track record of safe work practices, quality workmanship, and technical expertise have been paramount in the decision to hire a contractor. In recent years, Precision has been involved in an increasing number of LEED’s projects. Some of these project include: African Elephant Crossing at the Cleveland Metroparks Zoo , MC2 STEM High School , and Metroparks Sand Run. We are privileged to take part in this exciting movement towards sustainability in the construction industry. Due to the dust generated on construction projects — demolition in particular — many medical facility owners are requiring demolition adjacent to active operations to be performed in a negative pressure containment work area. In these instances, Precision’s familiarity with containments and engineering controls for negative air is a major asset to being able to perform what is expected. "Precision is my preferred contractor. Great work, excellent service and response, very competitive pricing."